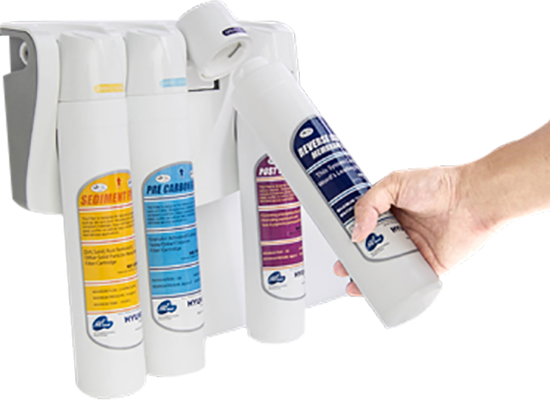 At Purestream Water Filters we pride ourselves on acknowledging needs in the market place and then looking to meet those needs. Over the years I regularly have people on the phone requiring assistance with undoing housings to change cartridges, whether it be undersink, portable units or shower filters. Plus we have time poor customers who once a year struggle to remember what to do and with the cost of trades people these days, making the yearly exchange simple has been Purestream's goal. We also have an ageing population and with this in mind over the past 12 months I have aggressively searched for an innovative range of water filters that are easy DYI whilst maintaining the highest quality backed by a 10 Year Warranty. Whilst there are easy change (bayonet) systems currently available these are expensive ranging upwards of $700 with expensive replacement cartridges. Purestream fully appreciates that the yearly ongoing costs are even more important than the initial cost and when standard housing cartridges are half the price of bayonet style, Purestream has not, until now, entered the easy change market. Purestream is very proud to introduce the KwikTwist™ range manufactured by a world leader in engineering and water purification. KDF Shower filter that is totally disposable, eliminating the difficulties some customers find in replacing cartridges. A combination of KwikTwist™ cartridges are incorporated in all models. These include sediment, pre carbo,n Ultra fine Membrane for Bacteria/Giardia removal, Reverse Osmosis Membrane for mineral removal, post carbon and a KDF cartridge for heavy metal including copper, lead, zinc etc. KT9-USRO 4-Stage undersink reverse osmosis is sleek with relevant Automatic Shut-Off Valve, Check Valves, etc. incorporated into the head of the unit, keeping them secure and eliminating the possibility of unexpected disconnection, crinking etc. The unit incorporates the Purestream specially designed Membrane Service Mode. For skematics check out How To section. Including Sediment, Pre carbon block to minimise release of fibres, Filmtec USA made TFC 75gpd membrane and post carbon filter. Portable models are also available. Twin and triple stages are available and all include a premium 0.01 Ultra Filtration Membrane for the removal of Viruses, Bacteria, Giardia E-coli. Included with sediment, carbon as well as KDF for heavy metal removal, providing a unique range of filters for use on both chlorinated and tank water. Sleek and compact these units measure 33H x 20W (cm).